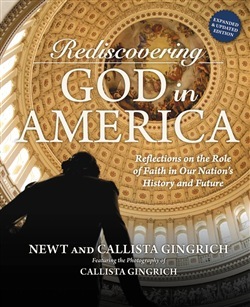 In this updated and redesigned edition of the New York Times bestseller, Newt and Callista Gingrich invite you on a walking tour of America's capital city; Washington, D.C. As a reminder of God's role in the history and future of America, Newt and Callista Gingrich give readers a look into the architecture and beauty of the nation's Capitol in REDISCOVERING GOD IN AMERICA. Readers will take a walk through Washington, D.C. to view the nation's monuments and memorials, including the National Archives, where Thomas Jefferson's immortal words jump off the page. But this is not simply a walking tour of the city; this is a tour of American history--of great men and women, events, documents, institutions, and ideas--all shaped decisively by the genuine belief that America is a nation founded under God. Readers will quickly find themselves on a profound path of discovery and renewal. Acquista Rediscovering God in America in Epub: dopo aver letto l’ebook Rediscovering God in America di Newt Gingrich, Callista Gingrich ti invitiamo a lasciarci una Recensione qui sotto: sarà utile agli utenti che non abbiano ancora letto questo libro e che vogliano avere delle opinioni altrui. L’opinione su di un libro è molto soggettiva e per questo leggere eventuali recensioni negative non ci dovrà frenare dall’acquisto, anzi dovrà spingerci ad acquistare il libro in fretta per poter dire la nostra ed eventualmente smentire quanto commentato da altri, contribuendo ad arricchire più possibile i commenti e dare sempre più spunti di confronto al pubblico online.